The key goal of income generation is to economically empower men, women, and youth by providing them with training in types of work that can earn them money in addition to their farming. Villagers can find opportunities to generate income by producing value-added products from agricultural produce and by promoting local handicrafts. One of the most important things is to support the village-based industries that already exist—sometimes for centuries. The essential ingredient is to provide the training needed to improve product quality, thus ensuring better prices and marketability. For example, our village in Uttar Pradesh is home to several families who make an income using the potter’s wheel. Their deft fingers give shape to many useful items for household use. Our team is working to help these potters get better prices for their products. One of the most important things is to support the village-based industries that already exist—sometimes for centuries. 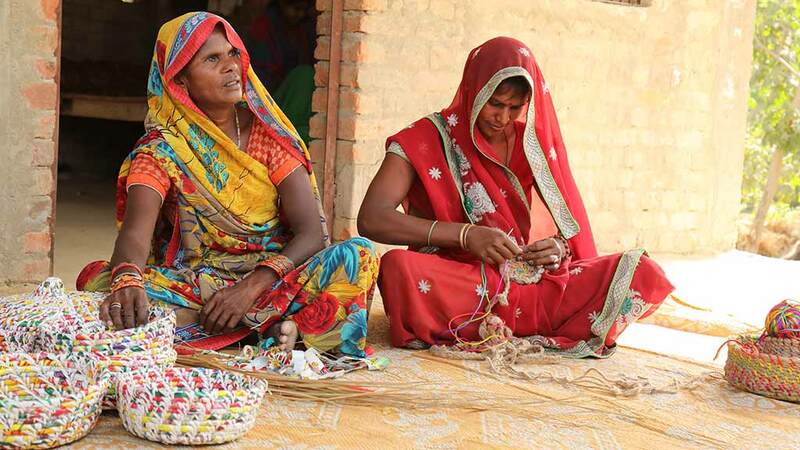 Another aspect is empowering women’s groups to learn a skill through which income generation is possible even from home. Tailoring is something that can be done in this way. Machines have been distributed and tailoring teachers have been appointed in several Amrita SeRVe villages. We have also had women from the villages come to Amritapuri for training in how to make newly stitched products out of upcycled materials. Another important aspect is the establishment of Self Help Groups (SHG’s). The first step is to create self-reliance groups (SRG’s) through gatherings that establish awareness and unity. Once that strength is there, micro-finance begins and everyone must contribute by participating in regular meetings. We are also empowering villagers by setting up businesses through milk co-operatives and farmers’ clubs.